Hello. I have been trying for quite some time to get two things going here and having quite a bit of trouble. Basically all I am trying to accomplish is to have a Windows 2008 R2 server the authoritative DNS server for my home network, lab, etc. and be capable have any further DNS servers implemented look to it for name resolution. Any addresses the Windows Server does not know about are forwarded to pfSense to the appropriate DNS server on the Internet. so when this is working on your internal lan. then it is a free choice if you want to use the pfsense as a forwarder for yourinternal dns or you just let your 2008 server do the name resulution on its own. "The second thing I am trying to get working is my reverse look-up, so I can access printers/servers/workstations by input of their host-name rather then IP address." 100.1.168.192.in-addr.arpa. 3600 IN PTR i5-w7.local.lan. 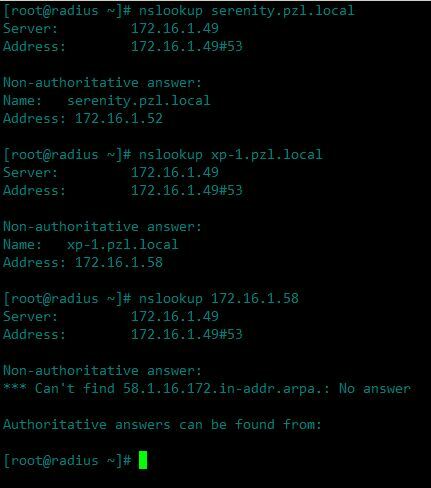 a reverse lookup is PTR record, forward would be a A record or AAAA record for ipv6, just create reverse zone for your network and put in the records you want and your good. if you want to see the flow with nslookup, set debug. If you wanting to actually do any real troubleshooting or understanding of what is happening with dns – the tool dig is much better suited then the very limited windows nslookup. Yes for PTR records your going to need the arpa zone.